Attendance was up from the prior year, with 757 warm bodies and 15 supporting members, and 854 total attending memberships purchased, compared to 2017’s approximately 720 warm bodies of the 844 total attending memberships and 12 supporting, and 2016’s 625 on site, of 638 attending memberships and 11 supporting. Nine countries were represented, with con-goers from Australia, Belgium, Canada, Denmark, France, Israel, Russia, the United Kingdom, and 45 states plus the District of Columbia. A sturdy tote bag was loaded with free books, but the pocket program was in short supply. The full-sized perfect bound souvenir book, with cover art by GOH Tom Kidd of a cloud-shrouded floating city, had more Kidd art inside, the com­mittee list, the World Fantasy Award nominations and honorees, appreciations and bibliographies for the toastmaster, guests of honor, and Life Achievement Awards winners, an in memoriam, and writing by Addison, Edelman, and Warren. The Renaissance Baltimore Harborplace Hotel was situated right on the harbor – a tourist destina­tion with restaurants; a sleek, modern aquarium; and more. The bar space was well suited for mingling. The con suite provided snacks as well as meals and a beautiful view of the ships. Programming started Thursday at 4:00 p.m. with readings and panels; over 350 industry professionals participated. Options included an open mic poetry slam (with Addison and Warren) and morning walks with Edelman to the Baltimore Farmers Market and his favorite donut shop. There were 37 panels scheduled. Programming co-chair Colleen Cahill said, “The theme… Ports in a Storm, along with the celebration of the 200th anniversary of Mary Shelley’s Frankenstein, provided a rich mine of inspi­ration….” Highlights included topics such as “Nautical Ghost Stories” with Nathan Ballingrud, Siobhan Carroll, F. Brett Cox, and Jason Sanford; “Fran­kenstein, Masculinity, and Femininity” with Barna Donovan, Theodora Goss, John Kessel, Natasha D. Lane, and Walter Jon Williams; “Frankenstein: The Intersection of Literature and Science” with Ted Chiang [edit: Chiang was absent], Kathy Goonan, and Lancelot Schaubert; and “History Abuse?” with David Drake, Carolyn Ives Gilman, Carlos Hernandez, Kay Kenyon, Louise Marley, and Erin Roberts. The schedule included over 100 readings with industry notables including S.A. Chakraborty, Tina Connolly, John Crowley, Andy Duncan, Jeffrey Ford, Max Gladstone, Alma Katsu, Guy Gavriel Kay, James Patrick Kelly, Derek Künsken, Ellen Kushner, Arkady Martine, Mary Anne Mohanraj, Ilana C. Myer, and more. The art show exhibited 33 artists and hundreds of pieces, including Alan Beck, Galen Dara, Donato Giancola, Kathleen Jennings, Elizabeth Leggett, Tom Kidd, Gary A. Lippincott, Gregory Manchess, Theresa Mather, Victo Ngai, Omar Rayyan, Ruth Sanderson, Charles Vess, and Michael Whelan. There was an exhibit of historic fantasy art organized by Joe Siclari and Edie Stern called “Women in Fantasy: Warrior, Wanton and Witch,” with 120 pieces provided by 20 artists and collectors, from about 70 different artists. Additional exhibits included a collection of Kidd’s work, a selection of Charles Vess’s illustrations, and a display of the molds Vincent Villafranca used to create the World Fantasy Award and matching finalist pins, and an exhibit about Edelman’s graphic novel work. During the art reception Gregory Manchess painted a portrait of Michael Swanwick. Organizers reported sales at over $35,000, compared to last year’s $26,000, and 2016’s $6,186. The mass autograph reception was Friday night, with a cash bar and a variety of finger foods. Signers were able to reserve seats in advance. Hundreds of authors attended including Gwenda Bond, Gerald Brandt, Curtis C. Chen, Zig Zag Claybourne, C.S.E. 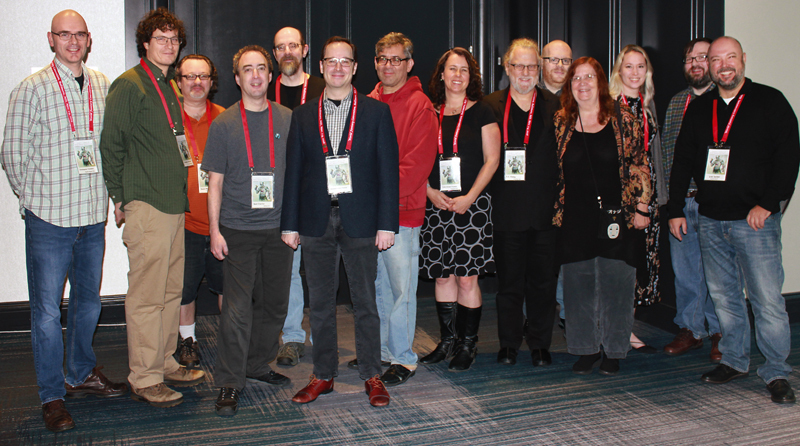 Cooney, Andy Duncan, Sarah Beth Durst, Charles E. Gannon, Daryl Gregory, Christopher Golden, Kathleen Ann Goonan, Nina Kiriki Hoffman, Sally Wiener Grotta, Eileen Gunn, Rajan Khanna, Joe Haldeman, Guy Gavriel Kay, Ellen Kushner, L.E. Modesitt, Jr., Sarah Pinsker, Delia Sherman, Sharon Shinn, Alan Smale, Fran Wilde, C. Ceres Wright, and many, many more. 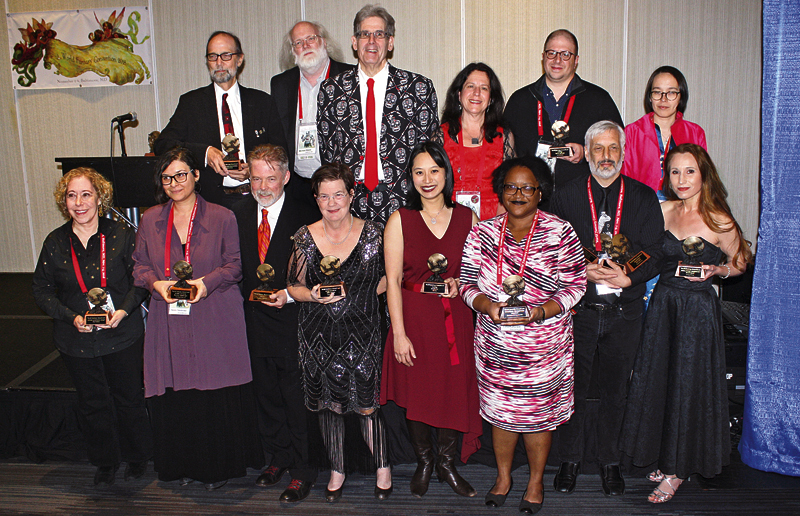 The World Fantasy Awards Banquet was held at 1:00 p.m. on Sunday after a brief reception, and was followed by the awards ceremony coordinated by the WFA committee. There were 195 people in attendance, up from around 180 in 2017; an additional 75 people sat in for just the awards presentation. Glowing LED centerpieces of ship motifs adorned the banquet tables – for sale at $20 each. After the con chairs opened the ceremony, Addison began her toastmaster speech by thanking the World Fantasy administrators. She then addressed the theme: “Safe havens can come to us in many ways. The home we live in, in relationships that nurture us…. But for too many people, the idea of safe haven is hard. When they are treated as less by others just because they are different in some way…. Skin, religion, sexual preference, age…. The danger of not having a safe haven is inside and out. On the outside… weapons, things thrown at you, looks…. The inside danger, I think it’s even harder because we don’t see it. The constant grinding down by society, even when people aren’t saying anything, ends up creating a sense of worthlessness in a lot of areas where people are committing suicide to get away from pain, because they feel like there is no safe place, no place of acceptance…. “I think about how this country has become dangerous for any human that looks or acts different; and now it’s become acceptable to behave in an inhuman way as a reaction for many people…. It takes away safe havens that just should have been – walking down the street, walking your dog…. “I’m just a human being…. I’ve always walked into any room as a human being. And I walk in wanting to meet other human beings, and talk, and I find people fascinating and wonderful…. My constant desire is for humanity to evolve to the point where we understand that we are all just human, and we all have the same wants and joys and pain and needs. “One other safe haven for me is writing…. It is the place I go, and it’s a very safe place, and my home…. Another huge safe haven for me is this community, because I work a lot less when I walk into a room with you guys; I have a lot less that I have to do to convince you that I’m human…. Addison’s full speech is scheduled to be published in the January 2019 issue of Uncanny magazine. Datlow presented the Special Award, Professional to Harry Brockway, Patrick McGrath and Danel Olson, for Writing Madness. Theodora Goss accepted for the trio. McGrath said he is honored and flattered, crediting Brockway, Olson, and publisher Jerad Walters, as well as thanking Joyce Carol Oates for the introduction. Brockway said he was “very thankful for the opportunity to be part of the team creating Writing Madness.” Olson praised the work of the other creators, and thanked the WFA members, judges, volunteers, his wife and daughters, the other finalists, and more. The World Fantasy Award for Novella went to Ellen Klages’s Passing Strange. Klages’s speech brought laughter, “I started writing this story 41 years ago. I have not worked on it every day.” She began the piece at age 23 after moving to San Francisco. “I wrote, I think, four scenes; I think one sentence ended up in Passing Strange…. Every time I got a new computer, I transferred the files, and I would look at these four scenes and say, ‘One day I should finish this story.”‘ She thanked editor Jonathan Strahan “for making me write the story that I wanted to write when I was 23, that I would not have done justice to.” She thanked Manchess for “the Best. Cover. Ever.” She thanked Irene Gallo, Lee Harris, and the audience. Most of the speakers at the event encouraged people to vote in the US midterm elections, happening shortly after the convention dates. Next year’s World Fantasy Convention will be held in Los Angeles CA, October 31 – November 1, 2019 at the Marriott Los Angeles Airport Hotel, with guests of honor Tad Williams, Margo Lanagan, and Beth Meacham, and toastmaster Robert Silverberg. The 2020 World Fantasy will be in Salt Lake City October 29 – November 1, 2020, with guests of honor Stephen Gallagher, Stephen Graham Jones, David Cherry, Anne Groell, and toastmasters Tracy & Laura Hickman. More information is available at the WFC site. This report and more like it in the December 2018 issue of Locus. Ted Chiang was not able to make the panel he’s mentioned with here; Kathleen Goonan said he was delayed by traffic (or his train).